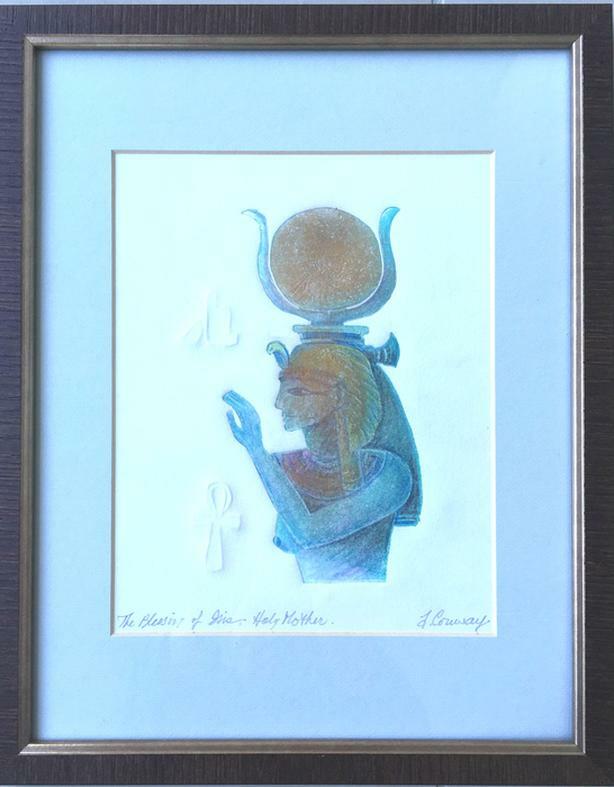  Log In needed $70 · Created by Renown Artist Ann-Rosemary Conway "The Blessing of Gia, Holy Mother"
The golds, greens and teals show in a metallic paint with symbols indented in the paper. Signed and titled by Rosemary Conway "The Blessinof Gia, Holy Mother". It has a new modern frame, light green matting and under glass. Framed size 18" x 14"
In the print shop I ink up a lino plate and dampen the thick new paper. i place it over the plate on the bed of the etching press. Turning the ships wheel I roll it through the press twice, to create a deep impression. Again the paper is put out to dry for a day or two. The inks take many days to dry. They resist the water on the paper need to shape the image permanently.